What Power Do Images Have in Our Society? Images and visual culture shape our reality – in all its nightmarish, as well as hopeful, potential. While visiting a sci-fi and comics convention in Toronto recently, I found myself drawn inexorably toward the sound of gunfire, explosions, and grunts of agony and triumph. It was a gaming championship, with hundreds of riveted viewers seated in a makeshift arena watching the video game battles play out on a big screen. The viewers, eyes focused and mouths agape, were absorbed by the action on the screen. But what was it they found compelling? Were they aroused by the thrill of martial action, as the animated characters kicked and punched at each other? Was it admiration of the players’ quick reflexes? (A smaller screen on the side afforded a glimpse of the players themselves, but it mostly focused on the twitches of their hand-muscles on the joysticks and consoles.) Or were they absorbed by some broader theme – the survival of their favourite character; the question of who would triumph and rule in this imaginary post-apocalyptic virtual scenario; or perhaps even the age-old theme of good versus evil? Were maybe some of them casting a critical technical eye to the quality of the graphics and the rapidity of the machine response to its user’s actions? What was it they saw in their heads as they gazed at this flat screen suspended several feet above them? 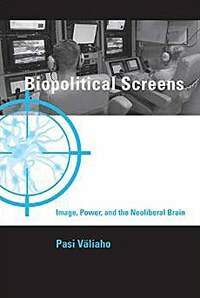 The broad question of how our society – and even our own brains and identities – are mediated by these electronic screens and images is explored in Pasi Valiaho’s impressive and thought-provoking new work, Biopolitical Screens: Image, Power, and the Neoliberal Brain. This is not a book for the casual reader: it’s a short read, but it’s a full-body theoretical immersion as intellectually stimulating (and demanding) for the reader as those video games were for the contestants. But for the reader who’s up for a heady challenge and perhaps even has some grounding in what is meant by concepts like biopolitics and neoliberalism, it’s an important and rewarding study. What power do images have in our society? A great deal, says Valiaho. In fact, images are really everything. They are the core of the ‘visual economy’. This doesn’t refer to how well video games sell: in this reading, Valiaho is drawing on the much older, and more accurate, definition of ‘economy’ as “the management of lived realities”. And increasingly, in today’s world, our realities are those which appear on screens. We work at a computer screen, where all of our relationships – whether they involve finances, engineering, negotiating, writing poetry, or coordinating vacation cruises – play out on that thin skin of electronics. We draw our leisure from screens – whether that involves playing video games, watching television, playing online Scrabble or even playlisting music videos. We engage in online dating via screens. We communicate through the screens of our phones; we rely on the screens of our cellphones or digital clocks to tell us what time it is; we gaze at the screens of monitors in the subway and on transit platforms to tell us whether our train is on time, what the weather will be tomorrow, and what the news headlines are. There is little in our lives that does not involve screens. But most importantly for those like Valiaho who are trying to understand what impact this has on us as modern human beings, screens are a medium, across which images interact with our brains. Images, he explains, are not just innocent little apparitions. They “act like vital entities at the intersection of mind and matter, undermining the distinction between appearances and the real world around us. They are dynamic… they mediate realms private and public and become the driving force of gestures, affections, and thoughts.” In this world where our existence is increasingly controlled and surrounded by screens, it is the images upon those screens that provoke us to think, feel, speak, cry, laugh, and act. Images, in a very real sense, are alive. This sense of the power of images has appeared throughout history. Indeed, Valiaho draws on the examples of historical practices like the dance rituals of indigenous peoples – whereby dancers simulated the image of snakes in order to draw the attention of the gods and incite them to respond with rainstorms – and the sacred value of icons in the early Christian church, to demonstrate that our brains have always engaged with imagery at a very deep level. But the ubiquity of screens in modern society has enabled us to surround ourselves with virtually limitless images, and this has in turn shaped our reality far more viscerally than the rain dancers of yore. Enter neoliberalism, that late 20th century economic model which still holds much of the world in its sway. In many ways a right-wing reaction to the post-WWII era of generous government welfare states, neoliberal ideologues argued for cuts to social programs and clamoured for austerity regimes, small government and the right of individuals to do whatever they want. More than just an economic model, it’s a worldview that conceives of the self-actualizing individual, who, independent of broader social structures, rises or falls on their own personal merit. It also envisions the world as contingent and unpredictable, full of risks and threats and profits, in which we only have ourselves to rely upon; our skills, not social programs or solidarity, will carry us through and determine whether we survive or not. Well, that’s a broad generalization, but it demonstrates how easily the neoliberal worldview engages with, for example, first-person shooter video games like Call of Duty. The goal is to survive in an unpredictable and constantly changing environment; even when you’re on a team you ultimately have only yourself to rely upon; everything around you is dangerous and only your instincts will carry you through. On a biological, neurological level, our body learns to adapt its sense of value to the gaming environment: the sight of an enemy in the distance provokes fear and anger and an instinctive aiming of our guns; the killing of an enemy produces a sense of deep satisfaction: we’ve lived to play another day. The intersection of neoliberalism and biopolitics continues to shape our contemporary reality, and some of its most pernicious effects occur at the subconscious level. As much as we seek to respond to financial crises, debt, unemployment, terrorism, and the many other uncertainties of the present, what emerges and impresses itself upon us far more deeply than the challenges posed by any single one of these factors, is an over-arching sense of uncertainty, insecurity, instability, and future full of potential threats. Yet these processes operate at a very deep, neurological level: it is more accurate, he suggests, to refer to neoliberal ‘brainhood’, rather than ‘self-hood’, insofar as our sense of self and subjectivity is itself produced by the operation of complex neurobiological systems within the brain. Or so the argument goes. The book comprises several interesting case studies that are used to unravel the complex arguments presented by the author. He analyzes the effect of gameplay in the first-person shooter war game Call of Duty: Modern Warfare 3. But video games are used not only to train our brains to predict and react to future threats; they can also be used to treat traumas in our past, and Valiaho explores at some length the phenomenon of post-traumatic stress disorder, as well as the use of virtual reality programs such as Virtual Iraq to help treat patients. In these processes, the metaphor of ‘screens’ may be more apt than many of us would think. Neuroscience is leaning toward the view, explains Valiaho, that “The brain ‘emulates’ reality instead of acting as a simple translator…[it] generates a ‘seamless, dreamlike movie’ by ‘anticipating or looking ahead’.” Many of us understand that our brain has a tendency to interpret the images it sees in terms of what it expects to see, but what’s remarkable is how extensive this process is. For all intents and purposes, we might think of ourselves as living in a virtual reality world, albeit one in which the form that virtual reality takes – which is to say, the images our brain conjures and selectively releases in response to our environment – can be affected and adapted (by, for instance, video games or other virtual reality activities). This can have serious consequences: it helps explain the many horrific situations in Iraq or Afghanistan when American soldiers have killed innocent civilians and even children: their brains have been trained to interpret even innocent gestures as potentially lethal threats, and to react instinctively. The virtual reality they have been trained to perceive around them is a dark one full of threat and menace. But all of this points to another important part of the equation: the brain’s ‘plasticity’. It has an incredible potential to re-shape itself. This, too, reflects “the basic neoliberal imperative that the subject always be ready to become something other than it was… the brain’s plasticity – its ability to constantly re-create itself, to become, and to adapt to new situations – entails not only modification or reparation, but also the destruction of form or identity.” Valiaho brings in the model of immunity, a model “which views the organism itself as a war zone, where the immune system constantly battles against outside threats to the organism’s identity and integrity.” The ‘outside threats’, of course, are images or acts that could threaten the neoliberal way of life. The portrait of the present and future depicted here is a grim one: one of a world populated by “neoliberal brains… whose past is a recurrent nightmare of catastrophe and whose future has been deprived of its promise (other than the deathliness of militarization and financialization).” Against such a grim backdrop, is there any hope? Any glimmerings of an alternate reality of future possibilities?